Valgrande is a vast fishing valley that stretches over an area of 360 hectares, in the green portion of land adjacent to Via Baseleghe. A place that wanted and created by man for centuries is based on the perfect balance between anthropic and the natural environment. Here you can walk the trails on foot or on horseback, that wind in this place, to its scents and colors of the flowers of the plants while enjoying an exclusive corner of paradise. Discover the exclusive location of Valgrande and book your next holiday here! Follow the signs for Highway A4, exit Portogruaro or Latisana (recommended), go to Bibione. Follow the signs for Highway A4, exit Latisana, go to Bibione. At the entrance of Bibione at the roundabout take the first exit by Baseleghe continue for 3 km towards Bibione Lido del Sole. Arriving by plane is scheduled transfer service from the airport to Valgrande Resort. Information and costs will be announced at the time of booking. 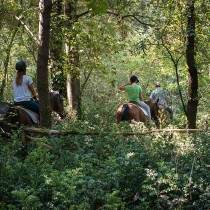 On foot, by bicycle or on horseback…Bibione can easily conquer you with the natural scenery of Val Grande, an example of harmony between man and his land, which surprisingly turns out to be divided in two places. Walking through the green scrubs of pines or in the lighthouse’s area, going through the numerous cycle paths, in Bibione you may discover a natural and still intact environment . And Val Grande is a real flagship in a location, where the respect of the environment is something to be proud of. Is a ancient lowland formed during the construction of the Tagliamento’s delta. The Valley is a vast area that has lower levels next to the Lake Valley (central part of the Valley), rates that rise lightly to the South (wooded area), remaining indeed limited to the North (along the Lagugnana’s Canal), where a reclamation of drain was necessary in the twentieth century. Its history is particularly interesting because, despite its location near the Caorle’s Lagoon, the valley hasn’t shared its origins with it. As a matter of fact, the fishing Valley was established in 1600 thanks to the inundation of the lowland, as demonstrated by the numerous documents that portray before and after the intervention. As a matter of fact, in the seventeenth Century, next to the Senate decree that established the destruction of the fishing Valleys in the Lagoon of Venice – as they obstructed the flow of water and reduced it to marshland – it became necessary to find other Venetian areas to continue the fish farming. It was then that the Venetian Patrician Antonio da Molin decided to inundate the area of Bibione to make it suitable for fishing. It should be stressed that this genesis still affects the environmental balance of the area that does not depend on the maintenance of the natural dynamics but, instead, on the geo-structure that the human intervention has produced over time. As a matter of fact, the organization of the valley allows the lives of many plants and animals typical of damp ecosystems, by gradually substituting the natural dynamics for the peculiar ones, aimed to maintain the geo-structure created in a given phase. In fact, the various owners who have succeeded, have acted through traditional techniques and interventions that have kept intact the physiognomy of the Valley; this great commitment has helped Val Grande to become an heritage of cultural and natural resources, certainly one of the most interesting in Europe. It is in fact rare to see such a system of integrated elements: a stretch of water articulated in useful lakes for fishing; a forest of high plant and animal biodiversity; fossil dunes that contain important Roman ruins; an old Valley’s lodge, historic home of the Valais. The hereditament has, in fact, ensured a culture and sensitivity of the owners who have succeeded (Molin, Nani Mocenigo, Pisani, de Lazara, Deaf, Ferri) , such as to enhance the geo-structure in an integrated way, even when, during the last century, the valley was divided in two properties: Val Grande and Vallesina. Today, the Valley is open to visitors to promote its knowledge and to offer the possibility to trace the ancient history of Bibione. All information and excursions in Valley.